The Marshall Islands, officially the Republic of the Marshall Islands (Marshallese: Aolepān Aorōkin M̧ajeļ), is an island country located near the equator in the Pacific Ocean, slightly west of the International Date Line. Geographically, the country is part of the larger island group of Micronesia. The country's population of 53,158 people (at the 2011 Census) is spread out over 29 coral atolls, comprising 1,156 individual islands and islets. The islands share maritime boundaries with the Federated States of Micronesia to the west, Wake Island to the north, Kiribati to the southeast, and Nauru to the south. 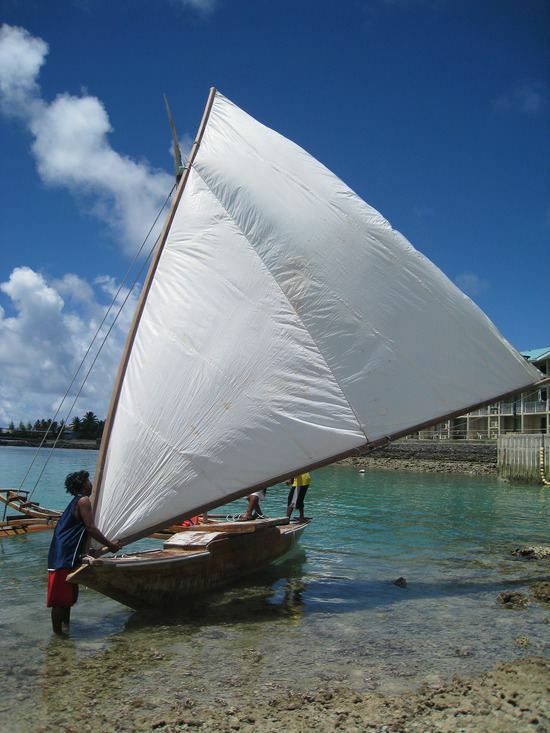 About 27,797 of the islanders (at the 2011 Census) live on Majuro, which contains the capital. Data from the United Nations indicates an estimated population in 2017 of 53,134. In 2016, 73.3% of the population were defined as being "urban". The UN also indicates a population density of 295 per km2 (765 people per mi2) and its estimated 2020 population is 53,263. Spain claimed the islands in 1592 and the European powers recognized its sovereignty over the islands in 1874. They had been part of the Spanish East Indies formally since 1528. Later, Spain sold the islands to the German Empire in 1885, and they became part of German New Guinea that year, run by the trading companies doing business in the islands, particularly the Jaluit Company. In World War I the Empire of Japan occupied the Marshall Islands, which in 1920, the League of Nations combined with other former German territories to form the South Pacific Mandate. 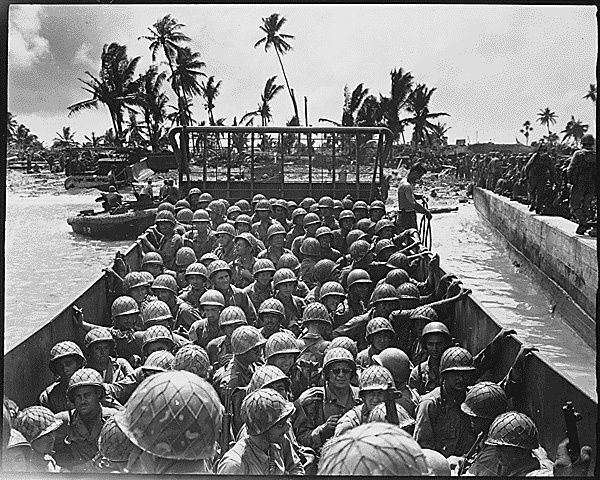 During World War II, the United States conquered the islands in the Gilbert and Marshall Islands campaign in 1944. Nuclear testing began in 1946 on Bikini Atoll after residents were evacuated. Over the years, 67 weapon tests were conducted, including the 15-megatonne Bravo hydrogen bomb test that created significant fallout in the region. The testing concluded in 1958. Over the years, some cleanup was completed by the US government. 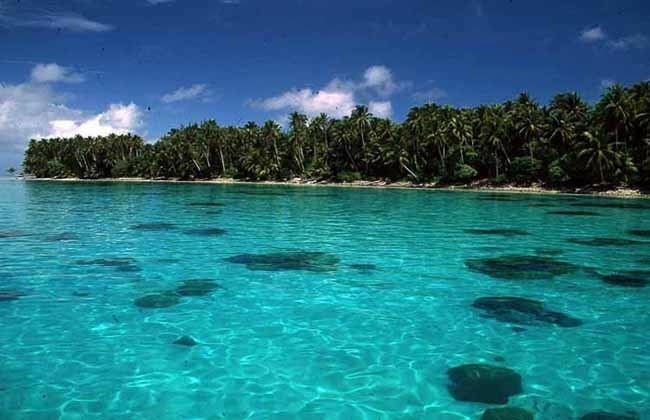 The US government formed the Congress of Micronesia in 1965, a plan for increased self-governance of Pacific islands. The Trust Territory of the Pacific Islands in 1979 provided independence to the Marshall Islands, whose constitution and president (Amata Kabua) were formally recognized by the US. Full sovereignty or Self-government was achieved in a Compact of Free Association with the United States. Marshall Islands has been a United Nations member state since 1991. Politically, the Marshall Islands is a presidential republic in free association with the United States, with the US providing defense, subsidies, and access to U.S. based agencies such as the Federal Communications Commission and the United States Postal Service. With few natural resources, the islands' wealth is based on a service economy, as well as some fishing and agriculture; aid from the United States represents a large percentage of the islands' gross domestic product. The country uses the United States dollar as its currency. The majority of the citizens of the Republic of Marshall Islands, formed in 1982, are of Marshallese descent, though there are small numbers of immigrants from the United States, China, Philippines, and other Pacific islands. The two official languages are Marshallese, which is a member of the Malayo-Polynesian languages, and English. Almost the entire population of the islands practises some religion, with three-quarters of the country either following the United Church of Christ – Congregational in the Marshall Islands (UCCCMI) or the Assemblies of God. Spanish explorer Alonso de Salazar was the first European to see the islands in 1526, commanding the ship Santa Maria de la Victoria, the only surviving vessel of the Loaísa Expedition. On August 21, he sighted an island (probably Taongi) at 14°N that he named "San Bartolome". On September 21, 1529, Álvaro de Saavedra Cerón commanded the Spanish ship Florida, on his second attempt to recross the Pacific from the Maluku Islands. He stood off a group of islands from which local inhabitants hurled stones at his ship. These islands, which he named "Los Pintados", may have been Ujelang. On October 1, he found another group of islands where he went ashore for eight days, exchanged gifts with the local inhabitants and took on water. These islands, which he named "Los Jardines", may have been Enewetak or Bikini Atoll. The Spanish ship San Pedro and two other vessels in an expedition commanded by Miguel López de Legazpi discovered an island on January 9, 1530, possibly Mejit, at 10°N, which they named "Los Barbudos". The Spaniards went ashore and traded with the local inhabitants. On January 10, the Spaniards sighted another island that they named "Placeres", perhaps Ailuk; ten leagues away, they sighted another island that they called "Pajares" (perhaps Jemo). On January 12, they sighted another island at 10°N that they called "Corrales" (possibly Wotho). On January 15, the Spaniards sighted another low island, perhaps Ujelang, at 10°N, where they described the people on "Barbudos". After that, ships including the San Jeronimo, Los Reyes and Todos los Santos also visited the islands in different years. The islanders had no immunity to European diseases and many died as a result of contact with the Spanish. Captain John Charles Marshall and Thomas Gilbert visited the islands in 1788. The islands were named for Marshall on Western charts, although the natives have historically named their home "jolet jen Anij" (Gifts from God). Around 1820, Russian explorer Adam Johann von Krusenstern and the French explorer Louis Isidore Duperrey named the islands after John Marshall, and drew maps of the islands. The designation was repeated later on British maps. In 1824 the crew of the American whaler Globe mutinied and some of the crew put ashore on Mulgrave Island. One year later, the American schooner Dolphin arrived and picked up two boys, the last survivors of a massacre by the natives due to their brutal treatment of the women. A number of vessels visiting the islands were attacked and their crews killed. In 1834, Captain DonSette and his crew were killed. Similarly, in 1845 the schooner Naiad punished a native for stealing with such violence that the natives attacked the ship. Later that year a whaler's boat crew were killed. In 1852 the San Francisco-based ships Glencoe and Sea Nymph were attacked and everyone aboard except for one crew member were killed. The violence was usually attributed as a response to the ill treatment of the natives in response to petty theft, which was a common practice. In 1857, two missionaries successfully settled on Ebon, living among the natives through at least 1870. The international community in 1874 recognized the Spanish Empire's claim of sovereignty over the islands as part of the Spanish East Indies. Although the Spanish Empire had a residual claim on the Marshalls in 1874, when she began asserting her sovereignty over the Carolines, she made no effort to prevent the German Empire from gaining a foothold there. Britain also raised no objection to a German protectorate over the Marshalls in exchange for German recognition of Britain's rights in the Gilbert and Ellice Islands. On October 13, 1885, the gunboat SMS Nautilus under Captain Fritz Rötger brought German emissaries to Jaluit. They signed a treaty with Kabua, whom the Germans had earlier recognized as "King of the Ralik Islands," on October 15. Subsequently, seven other chiefs on seven other islands signed a treaty in German and Marshallese and a final copy witnessed by Rötger on November 1 was sent to the German Foreign Office. The Germans erected a sign declaring an "Imperial German Protectorate" at Jaluit. It has been speculated that the crisis over the Carolines with Spain, which almost provoked a war, was in fact "a feint to cover the acquisition of the Marshall Islands", which went almost unnoticed at the time, despite the islands being the largest source of copra in Micronesia. Spain sold the islands to Germany in 1884 through papal mediation. A German trading company, the Jaluit Gesellschaft, administered the islands from 1887 until 1905. They conscripted the islanders as laborers. After the German–Spanish Treaty of 1899, in which Germany acquired the Carolines, Palau, and the Marianas from Spain, Germany placed all of its Micronesian islands, including the Marshalls, under the governor of German New Guinea. Catholic missionary Father A. Erdland, from the Missionaries of the Sacred Heart based in Hiltrup, Germany, lived on Jaluit from around 1904 to 1914. He was very interested in the islands and conducted considerable research on the Marshallese culture and language. He published a 376-page monograph on the islands in 1914. Father H. Linckens, another Missionary of the Sacred Heart visited the Marshall Islands in 1904 and 1911 for several weeks. He published a small work in 1912 about the Catholic mission activities and the people of the Marshall Islands. Under German control, and even before then, Japanese traders and fishermen from time to time visited the Marshall Islands, although contact with the islanders was irregular. After the Meiji Restoration (1868), the Japanese government adopted a policy of turning the Japanese Empire into a great economic and military power in East Asia. In 1914, Japan joined the Entente during World War I and captured various German Empire colonies, including several in Micronesia. On September 29, 1914, Japanese troops occupied the Enewetak Atoll, and on September 30, 1914, the Jaluit Atoll, the administrative centre of the Marshall Islands. After the war, on June 28, 1919, Germany signed (under protest) the Treaty of Versailles. It renounced all of its Pacific possessions, including the Marshall Islands. On December 17, 1920, the Council of the League of Nations approved the South Pacific Mandate for Japan to take over all former German colonies in the Pacific Ocean located north of the Equator. The Administrative Centre of the Marshall Islands archipelago remained Jaluit. The German Empire had primarily economic interests in Micronesia. The Japanese interests were in land. Despite the Marshalls' small area and few resources, the absorption of the territory by Japan would to some extent alleviate Japan's problem of an increasing population with a diminishing amount of available land to house it. During its years of colonial rule, Japan moved more than 1,000 Japanese to the Marshall Islands although they never outnumbered the indigenous peoples as they did in the Mariana Islands and Palau. The Japanese enlarged administration and appointed local leaders, which weakened the authority of local traditional leaders. Japan also tried to change the social organization in the islands from matrilineality to the Japanese patriarchal system, but with no success. Moreover, during the 1930s, one third of all land up to the high water level was declared the property of the Japanese government. Before Japan banned foreign traders on the archipelago, the activities of Catholic and Protestant missionaries were allowed. Indigenous people were educated in Japanese schools, and studied the Japanese language and Japanese culture. This policy was the government strategy not only in the Marshall Islands, but on all the other mandated territories in Micronesia. On March 27, 1933, Japan gave notice of withdrawal from the League of Nations, but continued to manage the islands, and in the late 1930s began building air bases on several atolls. The Marshall Islands were in an important geographic position, being the easternmost point in Japan's defensive ring at the beginning of World War II. In World War II, the United States, during the Gilbert and Marshall Islands campaign, invaded and occupied the islands in 1944, destroying or isolating the Japanese garrisons. In just one month in 1944, Americans captured Kwajalein Atoll, Majuro and Enewetak, and, in the next two months, the rest of the Marshall Islands, except for Wotje, Mili, Maloelap and Jaluit. The battle in the Marshall Islands caused irreparable damage, especially on Japanese bases. During the American bombing, the islands' population suffered from lack of food and various injuries. Of the 5100-man Japanese garrison (2600 Imperial Japanese Navy and 2500 Imperial Japanese Army) on the Mili Atoll only half survived to the end of the war. Following capture and occupation by the United States during World War II, the Marshall Islands, along with several other island groups located in Micronesia, passed formally to the United States under United Nations auspices in 1947 as part of the Trust Territory of the Pacific Islands established pursuant to Security Council Resolution 21. From 1946 to 1958, the early years of the Cold War, the United States tested 67 nuclear weapons at its Pacific Proving Grounds located in the Marshall Islands, including the largest atmospheric nuclear test ever conducted by the U.S., code named Castle Bravo. "The bombs had a total yield of 108,496 kilotons, over 7,200 times more powerful than the atomic weapons used during World War II." With the 1952 test of the first U.S. hydrogen bomb, code named "Ivy Mike," the island of Elugelab in the Enewetak atoll was destroyed. In 1956, the United States Atomic Energy Commission regarded the Marshall Islands as "by far the most contaminated place in the world." Nuclear claims between the U.S. and the Marshall Islands are ongoing, and health effects from these nuclear tests linger. Project 4.1 was a medical study conducted by the United States of those residents of the Bikini Atoll exposed to radioactive fallout. From 1956 to August 1998, at least $759 million was paid to the Marshallese Islanders in compensation for their exposure to U.S. nuclear weapon testing. In 1986, the Compact of Free Association with the United States entered into force, granting the Republic of the Marshall Islands (RMI) its sovereignty. The Compact provided for aid and U.S. defense of the islands in exchange for continued U.S. military use of the missile testing range at Kwajalein Atoll. The independence procedure was formally completed under international law in 1990, when the UN officially ended the Trusteeship status pursuant to Security Council Resolution 683. The Republic was admitted to the UN in 1991. In 2003, the US created a new Compact of Free Association for the Republic Marshall Islands and Micronesia, with funding of $3.5 billion to be made over the next 20 years. In 2008, extreme waves and high tides caused widespread flooding in the capital city of Majuro and other urban centres, 3 feet (0.91 m) above sea level. On Christmas morning in 2008, the government declared a state of emergency. In 2013, heavy waves once again breached the city walls of Majuro. In 2013, the northern atolls of the Marshall Islands experienced drought. The drought left 6,000 people surviving on less than 1 liter (0.26 U.S. gal) of water per day. This resulted in the failure of food crops and the spread of diseases such as diarrhea, pink eye, and influenza. These emergencies resulted in the United States President declaring an emergency in the islands. This declaration activated support from US government agencies under the Republic's "free association" status with the United States, which provides humanitarian and other vital support. Following the 2013 emergencies, the Minister of Foreign Affairs Tony deBrum was encouraged by the Obama administration in the United States to turn the crises into an opportunity to promote action against climate change. DeBrum demanded new commitment and international leadership to stave off further climate disasters from battering his country and other similarly vulnerable countries. In September 2013, the Marshall Islands hosted the 44th Pacific Islands Forum summit. DeBrum proposed a Majuro Declaration for Climate Leadership to galvanize concrete action on climate change. Rising sea levels are threatening the islands. Regardless of the cause, much of the area of the islands may become uninhabitable if the levels become excessive. Major flooding occurred in 2014 leading to a state of emergency for Majuro. Thousands of islanders have already moved to the US over the past decades for medical treatment and for better education or employment, many settling in Arkansas; emigration is likely to increase as sea levels rise. The right of residents to do so ends in 2023 unless the Compact with the US is renewed. The United States Geological Survey in 2014 warned that rising sea levels will salinize the fresh water on the islands, "thus likely forcing inhabitants to abandon their islands in decades, not centuries, as previously thought". A report in mid 2017 by Stanford University, some 70 years after 23 atomic bombs were detonated on Bikini Atoll, indicates abundant fish and plant life in the coral reefs. That area of the islands was still not inhabitable by humans, however, due to contamination by radioactivity. A 2012 report by the United Nations had indicated that the contamination was "near-irreversible". A 2007–2008 study revealed that the rate of type 2 diabetes is among the highest in the world; 28% over the age of 15; 50% over 35. Approximately 75% of women, and 50% of men are overweight or obese. This is mostly due to the adoption of an unhealthy diet and lack of exercise. About 50% of all surgeries performed on the island are amputations due to complications from diabetes. There are no facilities for renal dialysis. According to a report by the BBC, life expectancy is 67 years for men and 71 years for women. On 28 April 2015, the Iranian navy seized the Marshall Island-flagged MV Maersk Tigris near the Strait of Hormuz. The ship had been chartered by Germany's Rickmers Ship Management, which stated that the ship contained no special cargo and no military weapons. The ship was reported to be under the control of the Iranian Revolutionary Guard according to the Pentagon. Tensions escallated in the region due to the intensifying of Saudi-led coalition attacks in Yemen. The Pentagon reported that the destroyer USS Farragut and a maritime reconnaissance aircraft were dispatched upon receiving a distress call from the ship Tigris and it was also reported that all 34 crew members were detained. US defense officials have said that they would review U.S. defense obligations to the Government of the Marshall Islands in the wake of recent events and also condemned the shots fired at the bridge as "inappropriate". It was reported in May 2015 that Tehran would release the ship after it paid a penalty. The International Monetary Fund reported in mid 2016 that the economy of the Republic had expanded by about 0.5 percent in the Fiscal Year 2015 thanks to an improved fisheries sector. A surplus of 3% of GDP was recorded "owing to record-high fishing license fees. Growth is expected to rise to about 1.5 percent and inflation to about 0.5 percent in FY2016, as the effects of the drought in earlier 2016 are offset by the resumption of infrastructure projects." Fishing license fees (primarily for tuna) do provide noteworthy income for the government. In 2015, for example, this source produced $197.8 million, in Australian dollars (AUD), although estimates for 2016 suggested that a significant decline was probable in 2016. The Ministry of Education (Marshall Islands) operates the state schools in the Marshall Islands. There are two tertiary institutions operating in the Marshall Islands, the College of the Marshall Islands and the University of the South Pacific.